I just completed my stitch and glue Nutshell Dinghy project. She rows well and is small enough to easily lift on to my swim platform. Great job and nice looking dink. I would like to build a slightly larger dory with a sliding seat. Maybe big enough to give my lady a romantic evening glide in the swamp. I have plans from Bateau for an 11.5' semi-dory that can be sailed or rowed... I plan to build it this winter. I have seen thesr kits available in boat mags. Usually requiring one sheet or two of ply wood. Looks like a fun thing for the winter. For an easy to build dory that is VERY fast, look at "Big Dory" by Phill Bolger. I built it in the mid 90's and was very pleased. It is in Maine somewhere these days. Not a sliding seat but it can be adapted easily. This was just built from plans and I bought all the plywood and epoxy locally. The kits are expensive for what you get. This is about $250 in material and 14 hours labor in 1 and 2 hour chunks. I changed the plans somewhat to add a double skeg, so that the boat sits upright and hopefully track better while rowing. I'm about to order an Eastport pram from Chesapeake Light Craft. Haven't decided on the kit or the plans quite yet. Looking for a small 11' daysailer to build that we can carry on the aft cabin. Awsom build. How much time do you have into it? I've wanted to build the Shellback dinghy for years now but never been motivated enough to sit down and do it. I have the CNC to make easy work of it. It's on the list! Great photos everyone! Seems like about 4 months working 8-10 hours per week. Very nice! How did you like using the zip ties instead of copper wire? I've always used wire because I can use smaller holes. I guess it really doesn't matter. The holes get filled with epoxy putty and covered with glass cloth. I will always use copper wire in the future... The zip ties do not save time and do not look as good. We actually built two boats and the second one we used copper wire. The copper wire boat can go with out paint, the zip tie boat will be painted. Thanks for the info. Now I won't have to try it. My next project will be a 14' stitch / glue outboard skiff from Glen-L plans. Had a lot of fun building a Kingfisher single scull like the one below about 30 years ago (Haven't used it in the past 20. Shame on me.). Am thinking about building one of the Joel White Nutshells (I find the Shellback a little too tender for a tender). However, that Bateau V bottom 10 looks interesting and a bit like the Shellback. Finished the Eastport Pram kit. It sails well. 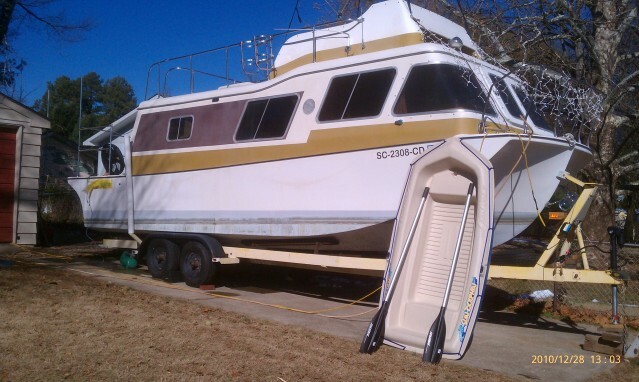 This is great stuff but unfortunately the boat I want to build is 7'6" X 27'. Not stitch and glue but planked w batten seams. Straight enough lines to be built of plywood but I'd love to have varnished topsides of cedar. The boat is "Marcia" and she's presented/designed as an inboard but I think she'll be fine as an OB w fuel and batts fwd. Big job though. I also like "Tang" .. a hull that would make a good trawler .. 10 to 14 knots w minimal power for that speed. The lines would need to be "scaled" of course and that has it's own problems. I think Tang's hull would make a better trawler than practically any hull on this forum. I'd post more but I'm w I-pad only and limited skills w same. I bought plans for the Two Paw 8 but never got around to building it 'cause a Sportyak filled the bill.